The nights are cooling down here in Kentucky and fall nip is in the air. Protecting your fall plants from frost is crucial. I think fall is the best time of year to grow vegetables. The soil is warm and the cool of the night air makes everything taste sweeter. Last year I grew right thru to December. I was able to do it using frost blanket. 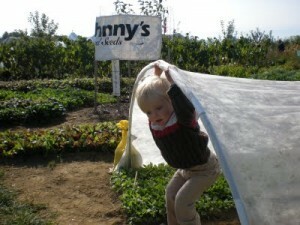 Row cover or frost blanket is a light weight, woven, poly product that comes in a sheet or roll. It can be laid right on top of the plants to protect from frost. The frost blanket material is porous so rain gets thru. It allows varying degrees of sunlight depending on how thick the row cover is: the thicker it is, the more frost protection, but the less sunlight. So it’s a tradeoff. I usually go with Dewitt Supreme. It offers up to 6 degrees of protection from frost, yet lets in 70% of available sunlight. Just lay it on top of the plants or hip it, and secure the cover with clips and bags filled with sand or anchor pins. A couple of other benefits from frost blanket – you can keep predators out of your harvest. Rabbits and deer ( and chickens!) usually won’t go thru the sheet. Also moths that lay eggs are unable to lay on the plants. The evaporation of water in the soil is slowed by the covers. This means less watering! For taller crop, you can use electrical conduit or wire to make hoops (see picture) to hold the frost blanket. This holds more heat in as well. Just clip the sheets directly to the conduit. On warm days just uncover the plants for maximum sun. We sell DeWitt frost blanket . It will last several seasons if attended to. Just make sure that you store it in a mouse proof container when not in use.